Duane Poole (book) and Larry Grossman (music) teamed up with Carol Hall (lyrics) to write the musical version of Truman Capote’s short story A Christmas Memory that premiered in 2010 at TheatreWorks Silicon Valley in Palo Alto moving to Off-Broadway in 2014. This time around Poole and Grossman brought along Kellen Blair to write the lyrics for a follow up on Ebenezer Scrooge’s life after his harrowing journey in A Christmas Carol. There have been many variations of A Christmas Carol and it has become a staple production year after year at many venues in the Bay Area and throughout the U.S.A. Have you ever thought what life was like for Scrooge after his fateful conversion by the ghost of Jacob Marley and the three ghosts of Christmas Past, Present and Future? 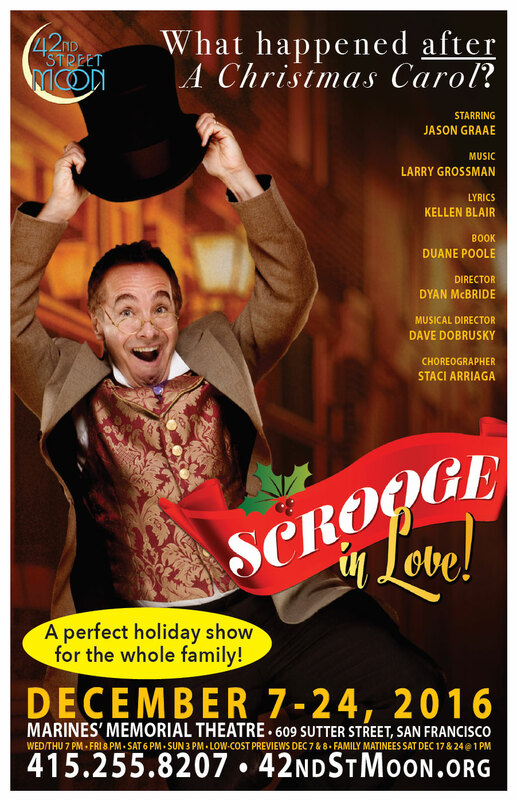 Think no more and secure your ticket to Scrooge in Love! (the exclamation point is part of the title) starring the inimitable Jason Graae and a strong supporting cast. It has all the ear marks of becoming a staple holiday treat in many venues. http://duanepoole.com/wp-content/uploads/2014/10/duanepoole4.png 0 0 Duane Poole http://duanepoole.com/wp-content/uploads/2014/10/duanepoole4.png Duane Poole2015-11-28 18:28:252017-01-16 18:30:25Marvelous world premiere of SCROOGE IN LOVE! gets 5 star rating.